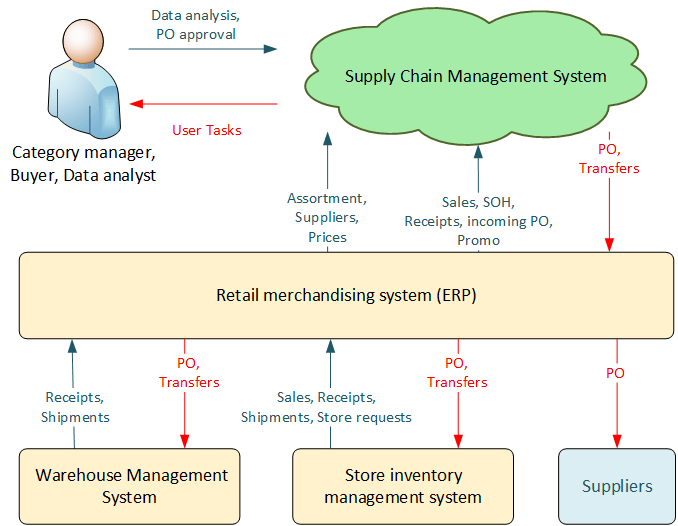 It is a SaaS-solution aimed to automate supply chain management in retail business. Cloud application RS.SCM is designed for retail chain of any size, format and product range requiring the fast improvement of their supply chain quality. RS.SCM provides launching without purchasing and setting up the required server equipment and auxiliary infrastructure. RS.SCM is compatible with any ERP-solution used by retailers. You do not need to change your management, warehouse or any other system to start working! One of the vital tasks in the retail business is to provide continuous stock availability on the store shelves. Meanwhile the stock should be optimal. On the one hand, it will enable you not to freeze your current assets, on the other hand, it will not increase your logistics costs due to frequent deliveries. Any retail business can significantly enhance its key indicators by improving the quality of supply management processes. Out-of-stock items mean a lost profit. RS.SCM eliminates the lost direct sales. Initially, a store product range comprises the most merchantable items. However the flashing out-of-stock situation leads to reduced sales thus resulting in the allowable purchase volume minimisation for such items (specifically when their shelf life is short). Eventually such items are out of the shelf more frequently and this process is looped till such items are completely washed out from the product range. RS.SCM prevents this natural washout of the optimal range. Part of your customers, not having found the product on the shelf, irreversibly goes to your competitors. It is hard to overestimate the damage from loosing your regular and loyal customers… RS.SCM implementation excludes such losses of regular customers. In most cases the delay in payment for products provided by the vendor does not exceed the market average sales period. Consequently if it takes you more time to sell the products you have to freeze your finances in the stock thus deteriorating the company’s performance. Improving supply chain processes quality allows you to free the current assets. Given the fact that a store effective area is its shopfloor area, the decrease in store rooms turned into storage facilities enables you to buy or rent the premises more efficiently. RS.SCM implementation ensures that the area required to open new outlets can be minimal. Stock damage leads to its writing off. Shrink/waste percentage is proportional to the available stock volume. Thus, less stock means less write-offs. RS.SCM cuts down losses from the stock damage. When store shelves are full all the time, product shoplifting leading to no availability of products on the shelf becomes more visible. RS.SCM cuts down losses from such shoplifting. Delivery cycle and stock volume is optimised both for the distribution centre and chain stores. When calculating orders RS.SCM considers different logistics parameters e.g. lead time, casepack multiple, unit multiplicity, expiry dates control, order approve time limits etc. A precise delivery calculation enables you to implement efficient product handling processes in the warehouse or DC, e.g. : cross-docking and pick-by-line in the warehouse or DC. The leading world retailers (for example, Tesco retail chain being rightfully considered as a trend setter in the supply chain management) utilise such mechanisms in their operations rather extensively. In RS.SCM you can compare the supply chain KPI regarding automatic algorithms operation and manually created purchase orders. Thus a decision making transparency is improved. RS.SCM reduces “human factor” dependency of your business. Notwithstanding the fact that experienced staff creates high quality orders in the long run their work results are less optimal due to the errors they make. Apart from that in case of staff changes, in the majority of cases, the knowledge is passed from one expert to another inefficiently. Forecasting based on cleared sales statistical data taking into account OOS, sales outliers, promo, seasons and holidays. To consider the retail specifics such approaches are used that being capable of sensing sparse sales and/or seasonality on the hierarchy aggregated levels followed by forecast distribution on per item basis. To cut down labour costs a forecasting algorithm is selected automatically. To cut down labour costs a replenishment algorithm can be selected automatically. Effective use of retail chain advantages in the supply chain where one or several DCs exist. Wave-like placing of purchase orders while considering promo and using DC as a buffer to square the forecast errors for separate stores. During the analysis there is a possibility to adjust linked stock replenishment parameters on-the-fly without searching for them using a separate interface. Master data and transaction are uploaded to RS.SCM at the end of the day. In the night time the system calculates indicators and targets, generates forecasts and creates purchase orders. In the morning the managers solve tasks and adjust the calculated orders. As scheduled a purchase order approval procedure is launched; orders are sent to the merchandise management system and vendors.